Advocating for needed services, medical care, and high-quality affordable housing. Raising awareness of local resources. 2016 AIP Forum - Susan Gold from Town of Cumberland Maine on Vimeo. 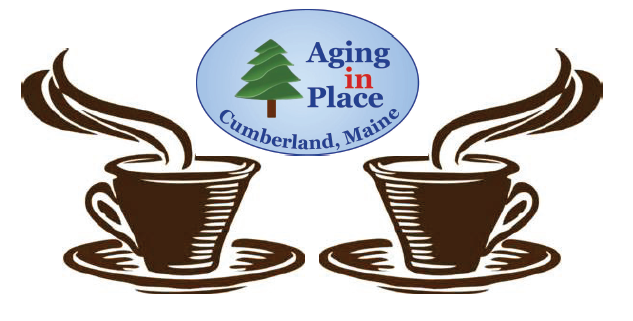 Aging in Place Cumberland now offers several services to aging residents in Cumberland and North Yarmouth: Cumberland Area Rides (CAR) Cumberland Area Rides, which launched March 1, is a collaborative between the Congregational Church in Cumberland and the town’s Aging in Place Cumberland program. CAR volunteers provide free rides to Cumberland and North Yarmouth seniors to appointments and activities (e.g., doctor, dentist, hair dresser, shopping, visits to friends, town activities, church services, etc.) that are within a 20-mile radius of Cumberland Center. Rides are available to seniors in Cumberland and North Yarmouth on weekdays between 9 am and 3 pm, and on Sundays between 9 am and 12 noon. The program’s 12 volunteers are already providing several rides a week. AIP’s Friendly Visitors program Volunteers for this program visit seniors of Cumberland and North Yarmouth in their homes at least every other week, providing friendship and companionship. Fourteen volunteers attended the training/orientation class on May 5, underwent background checks, provided references, and are awaiting their assignments to visit local seniors in their homes. The first visits are expected to begin in June. Handyman / Short-term Projects. This program provides seniors with assistance for light household maintenance duties. Examples include replacing light bulbs, raking leaves, cleaning the garage, painting, gardening, etc. No jobs should require licensure (e.g., plumber, electrician.) Vendors List: A growing number of vendors are listed on the AIP Cumberland website and in the Resource Guide. To be placed on the list, vendors need to be recommended by local customer(s) and agree to return customer phone calls within 48 hours (excluding weekends); provide references upon request; provide customer an estimated price (including any senior or other discount) in advance or performing any work (on request, the estimate will be in writing); provide the customer a realistic timeframe for performing the work; and provide AIP and the customer with information about his/her insurance coverage or lack of it. Individual workers are not screened by AIP. Activities/Recreation: An up-to date calendar of events that may appeal to seniors appears on the AIP website, including Mornings with Friends (an AIP initiative that meets monthly in two local churches and offers socialization, programs, and refreshments to seniors). Other AIP initiatives include Matter of Balance classes, a collaboration with the Tuttle Rd. Methodist Church and Southern Maine Agency on Aging; a walking program in collaboration with the Town Rec Dept and North Yarmouth; and a town bus, which provides transportation to various senior events. AIP Committee meets monthly and oversees AIP activities; subcommittees operate specific services (e.g. 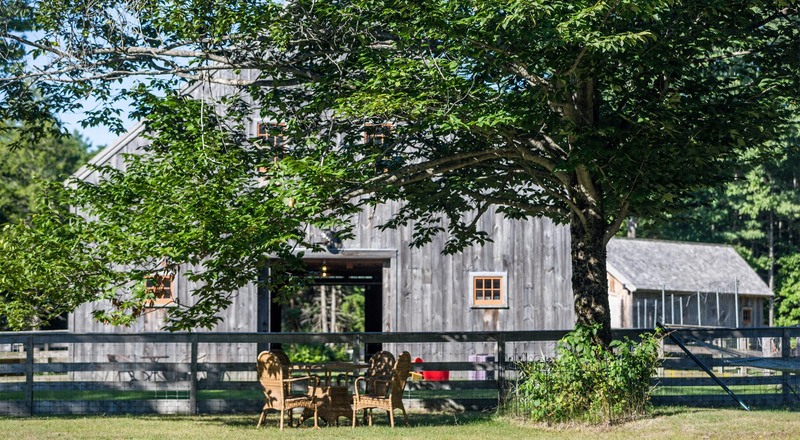 Friendly Neighbor, rides program); Part-time coordinator contracted through Southern Maine Agency on Aging coordinates efforts and provides expertise in structuring of programs. All follow written values above. We have partnered with the Town of Cumberland Recreation Dept., Fire and Police Dept., Prince Memorial Library, Southern Maine Agency on Aging, MSAD51, University of Southern Maine, North Yarmouth (for volunteers and recipients of services), Cumberland Wood Bank, Tuttle Road United Methodist Church (meeting space, volunteers), Congregational Church in Cumberland (meeting space, volunteers, and sponsorship of rides program), White Pine Community Church (volunteers for handyman projects), Church of Latter Day Saints (gardening projects), and other local churches (for listings of activities). Volunteers play a central role. They make up the AIP Committee, which directs the entire program. They also plan and put into place all the programs (rides, Friendly Visitor, etc.) and perform the actual work from training volunteers, interviewing seniors requesting services, to providing rides and visits. Strategies: Formation of subcommittees of dedicated volunteers to focus on specific programs; hiring of coordinator from SMAA to help coordinate programs. Challenges: Publicizing activities and services to a broader audience. Cumberland Area Rides is a collaborative between the Congregational Church in Cumberland and the town’s Aging in Place Cumberland program. 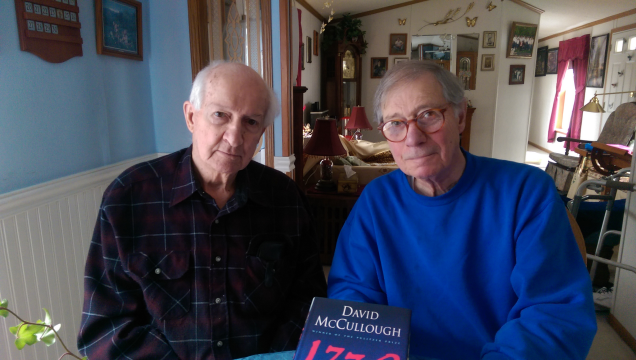 CAR volunteers provided 250 free rides to Cumberland and North Yarmouth seniors in its first year and continues to grow. Rides are provided to appointments and activities (e.g., doctor, dentist, hair dresser, shopping, visits to friends, town activities, church services, etc.) that are within a 20-mile radius of Cumberland Center. Rides are available to seniors in Cumberland and North Yarmouth on weekdays between 9 am and 3 pm, and on Sundays between 9 am and 12 noon. AIP Committee is working with town leaders and developers to provide senior housing. We are offering Handyman / Short-term Projects free for seniors in need. This program provides seniors with assistance with light household maintenance duties. Examples include replacing light bulbs, raking leaves, cleaning the garage, painting, gardening, etc. No jobs should require licensure (e.g., plumber, electrician.) There is also a listing of recommended vendors who have met certain criteria (but individual workers are not screened by AIP). Also providing (via website) list of questions to ask a vendor. Referrals to trusted sources of workers available for home repair, odd jobs/chores, to provide respite: Free service for seniors: Handyman / Short-term Projects. This program provides seniors with assistance for light household maintenance duties. Examples include replacing light bulbs, raking leaves, cleaning the garage, painting, gardening, etc. No jobs should require licensure (e.g., plumber, electrician.) Services for pay: Vendors List: A growing number of vendors are listed on the AIP Cumberland website and in the Resource Guide. To be placed on the list, vendors need to be recommended by local customer(s) and agree to return customer phone calls within 48 hours (excluding weekends); provide references upon request; provide customer an estimated price (including any senior or other discount) in advance or performing any work (on request, the estimate will be in writing); provide the customer a realistic timeframe for performing the work; and provide AIP and ￼￼￼￼￼￼￼￼￼￼￼￼the customer with information about his/her insurance coverage or lack of it. Individual workers are not screened by AIP. List of questions to ask vendors is on website. Matter of Balance classes; Mornings with Friends programming includes topics such as tai-chi. Town Rec Dept provides number of exercise/health classes. Annual forum provides sessions on dementia and other health-related topics. Durable Medical Equipment Loan Program: The Cumberland Fire Department manages a supply of Walkers, Wheel Chairs, Crutches, Commodes, Hospital Beds, Shower and Tub Seats, etc. for use by Cumberland residents. New acquisition: knee walker (scooter on wheels). Call-in: Residents can call the Fire Department every morning. If there’s no call, firefighters will do a safety check. Increase access to health and community services: We have partnered with the Town of Cumberland Recreation Dept. (exercise and health classes), Southern Maine Agency on Aging (Matter of Balance classes and referrals for additional services for seniors), Fire Dept. (durable medical goods and morning call-in program), Cumberland Food Pantry, and Cumberland Wood Bank program. In addition, AIP's website publicizes programs presented by Prince Memorial Library, MSAD51, Cumberland Historical Society, and local churches. Cumberland Aging in Place has an online calendar of events. A resource guide is available on our website. Hard copies are available at the Town Office. Signs with the Cumberland Aging in Place logo greet visitors to the community. Our Friendly Visitor program now has eight Friendly Visitors who provide companionship and friendship to Cumberland seniors. 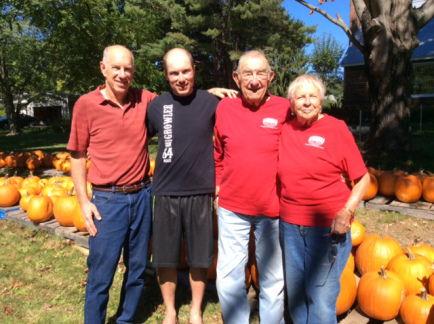 Food security: collaboration with Cumberland Food Pantry; referrals to Meals on Wheels through Southern Maine Agency on Aging; collaboration with schools and USM students in developing Interviews and Photo Exhibit of Town's Seniors; call-in program in collaboration with Cumberland Fire Department. Home Safety: Members of the Cumberland Fire Department will do a free safety inspection of your home and give tips on how to stay safe at home. 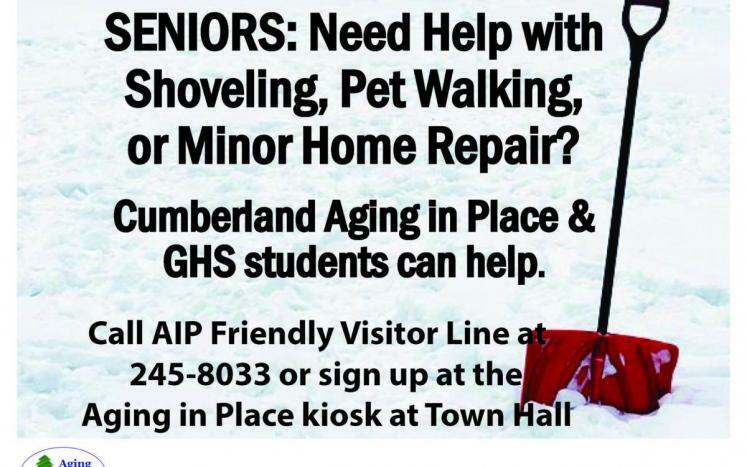 With the help of students from Greely Middle and High Schools, AIP Cumberland provides snow shoveling to seniors. Fliers delivered by volunteers to senior housing developments, website, local news media listings, kiosk at Town Office, flyers and wooden signs posted at various locations throughout town. The Town of Cumberland has established a tax relief program for older residents. People eligible for the program must reside in Cumberland, have lived in town at least a decade, and have a combined household income of no more than $69,000. Senior homeowners who have an income of $46,259 or less might be able to receive up to $750 in assistance. For more information download the Cumberland Senior Property Tax Program.